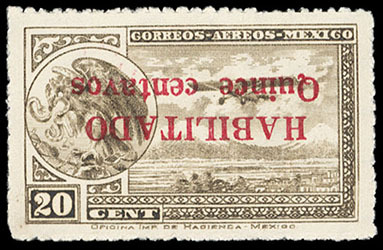 Mexico, 1931, 15c on 20c brown, inverted surcharge & double surcharge, single of each, full o.g., both bright and fresh, Very Fine. Scott No. C39a, C39b $300. 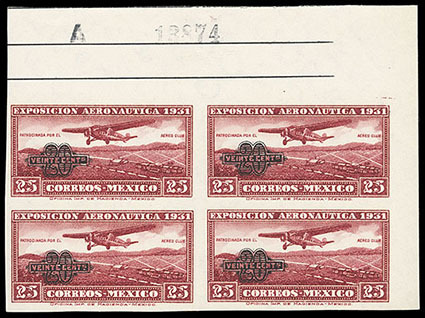 Mexico, 1932, 20c on 25c lake, imperf, top right corner margin block of 4, o.g., never hinged (gum skip and hinged in top selvage), rich deep color, Very Fine. Scott No. C45a $600 for singles. 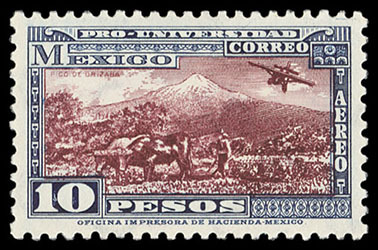 Mexico, Airmail, 1934, 5p-10p National University, full o.g., rich colors, Very Fine. 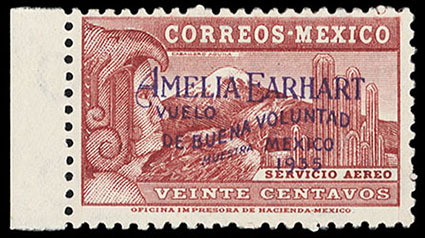 Mexico, 1935, 20c Amelia Earhart, "Muestra" overprint, left margin single, o.g., never hinged, rich color, tiny gum wrinkle not mentioned on certificate, Very Fine, very scarce; with 2018 M.E.P.S.I. certificate. Scott No. C74S Estimate $200 - 300. 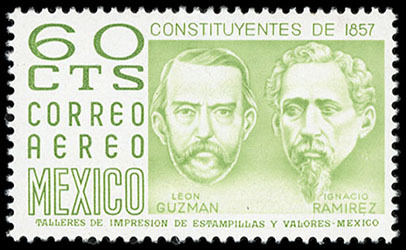 Mexico, 1975, 60c Guzman & Ramirez, o.g., never hinged (light gum bend and small tone spot on gum), bright and fresh, Very Fine, a rare and seldom offered key airmail issue; with 1998 M.E.P.S.I. certificate.